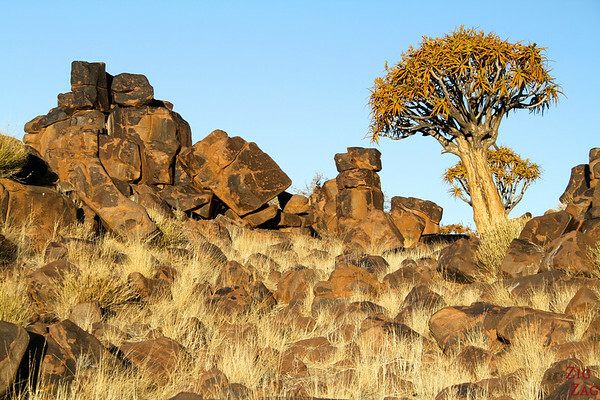 Namibia has so many various beautiful and impressive landscapes (like the majestic Fish River Canyon) but for some reason, the one that I am going to show you today is my favorite in Namibia: a place where the giant’s playground meets a quiver tree forest. The giant's playground is a place where huge dolorite boulders seemed to have been place in piles as if giants played lego with them. 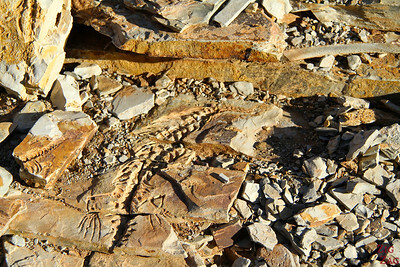 The unique rock formations were caused by the erosion of underling sedimentary rock sometime around 170 million years ago. 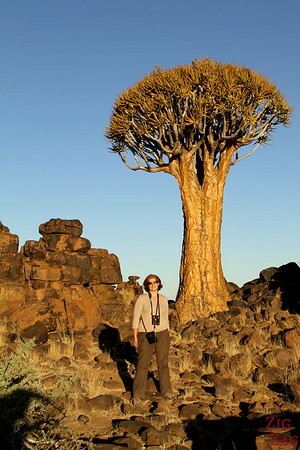 The Quiver tree forest is a national monument and a natural forest (no tree was planted).​ The quiver tree or "Kokerboom" is an aloe plant which botanical name is ALOE DICHOTOMA. Dichotoma refers to the forked branches. 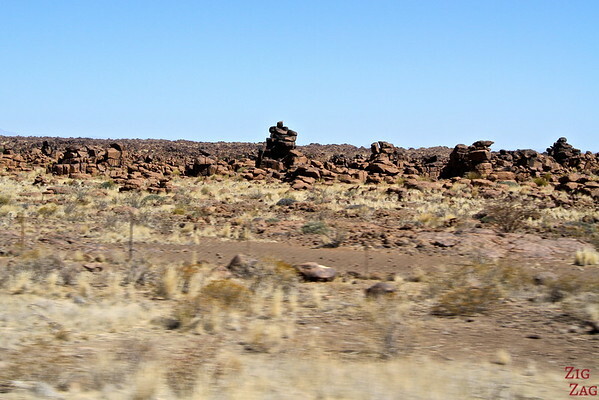 Why is it my favorite Namibian landscape? Well, to understand why I enjoyed it so much, you must first know that geology has always been my favorite subject in middle school. 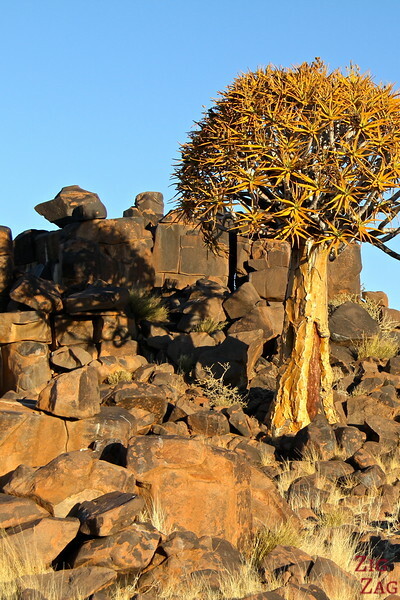 I like observing all the different rocks and the formations that appear everywhere on Earth. And I also love trees. I enjoy observing them, their shape, size, leaves colors etc My mum always tell people how as a baby, she would just place me under a tree and I was very calm babbling at the leaves.
. 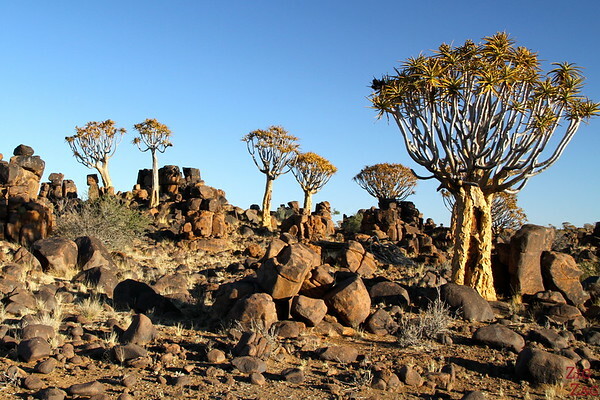 This place is the Giant’s playground mixed with the Quiver tree forest. 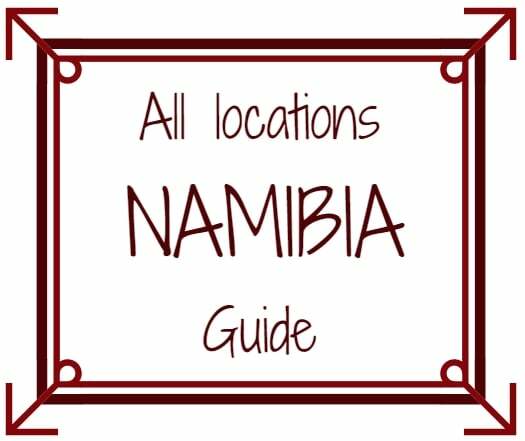 Do you understand why it is in my top 5 places to see in Namibia? First it started with the rocks. 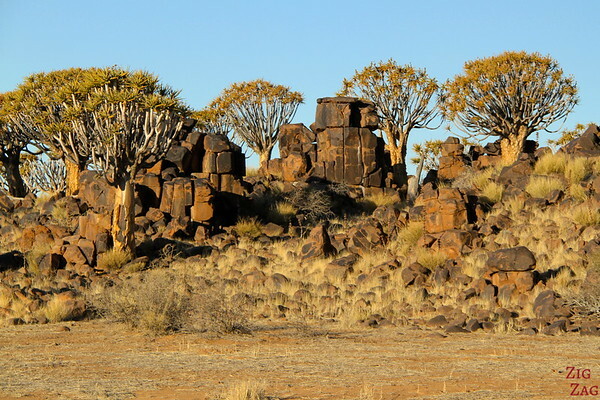 Piles and piles of big dolorite boulders that are between 160 and 180 million years old. It really looks like a giant had fun making piles with them! I could not believe that nature had done that not hundreds of thousands of bored people… It is hard to see on my picture but see the big pile at the front, well the whole land behind (for kilometers) is covered with those. 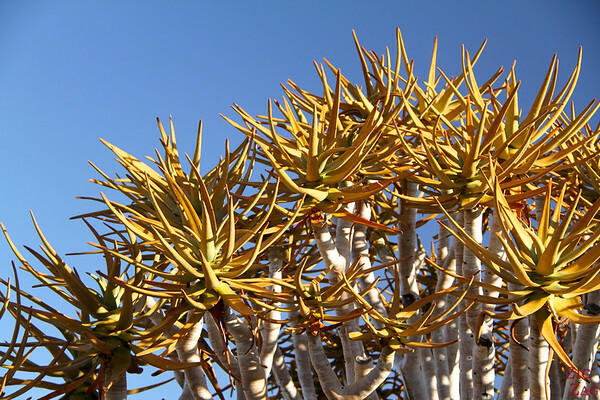 Then we discovered the Aloe dichotomy also called Quiver trees because bushmen use its branches to make quivers..These strange looking trees shaped by dichotomy. And all of these mixed in a surreal landscape where you are sure to win hide and seek if you are the one hiding! 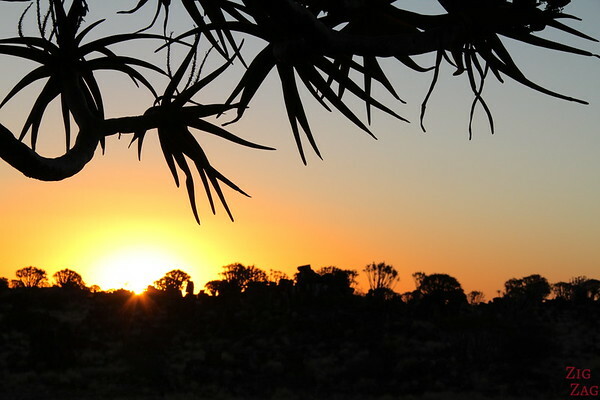 Its farm is covered by more than 5000 quiver trees! And he is an expert at playing music on the dolorite rocks. He left us to explore as we wished (although we did not go too far as it is easy to get lost). As our camp was just at the entry of his farm we were allowed to stay later. 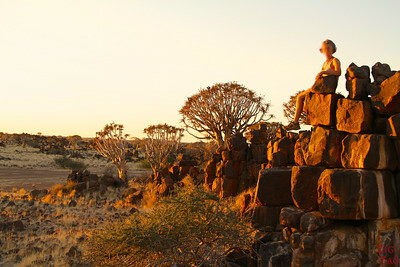 So we climbed on some rocks with our cold beers, and sat still and silently admiring the sun setting. 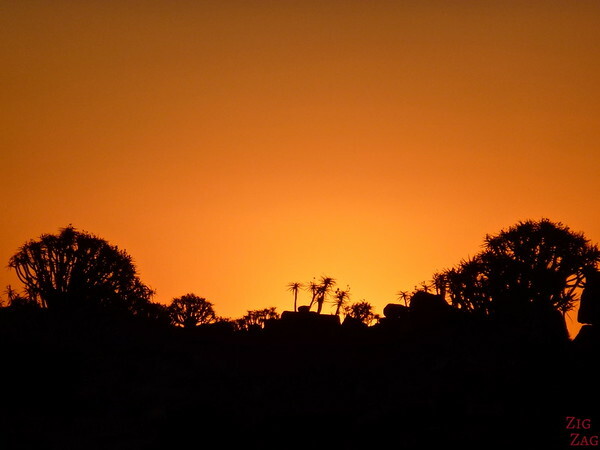 it was one of my favorite sunset in Namibia, equal with the wild ﻿sunset I had a week later. Do you understand why I am in love with this place?